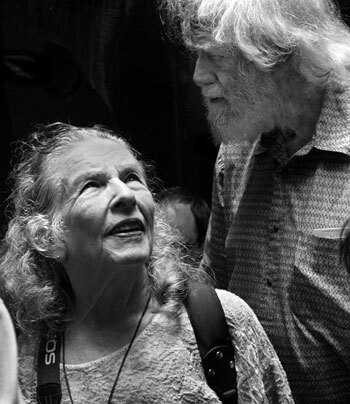 Alexander and Ann Shulgin are well-known elders who worked in the field of psychoactive research for decades. Their large collection of both primary and secondary physical materials needs to be organized, archived and made publicly available. We are seeking $25,000-$50,000 to support this. Donations can be made through Erowid Center (tax-deductible), or directly to Ann Shulgin. Targeted contribution to support the Shulgin Collection Project can be made through Erowid Center. Targeted contributions are earmarked specifically for this project. Donations made through Erowid Center are 100% tax-deductible in the United States. After years of consideration and preparation, the first several of Alexander Shulgin's lab books were scanned and put online. The lab books contain detailed experience reports about a wide variety of substances, as well as notes on chemical processes, formulas, sketches, and hand-drawn graphs. The Erowid crew is working to transcribe these lab books as they are digitized. When funding began for the project, the Shulgins' trusted assistants, gregM and Tania, began the labor-intensive process of redacting the names of individuals whose privacy should be protected. As the project has evolved, more printed materials from Sasha and Ann's files are being scanned and posted online. Additional funding supports the continuation of this laborious process. Erowid periodically needs volunteers to transcribe the texts into our Experience Vaults and edit the images to provide more contrast and make them more readable. If you would like to help with this project, please volunteer at Erowid.org/volunteer and learn about the current status of this opportunity. Funds are also needed to pay assistants to help with organizing, scanning, and processing Sasha's personal files. Please consider making a contribution to the Shulgin Collection Archiving project!